Spatially, anatomically correct spinal cord grown in the lab for the first time. A research group from the Cluster of Excellence at the TU Dresden (CRTD) demonstrated for the first time the in vitro growth of a piece of spinal cord in three dimensions from mouse embryonic stem cells. Correct spatial organization of motor neurons, interneurons and dorsal interneurons along the dorsal/ventral axis was observed. The study has been published by the journal Stem Cell Reports. For many years the team have been studying the regenerative potential of axolotls at the molecular level. The Mexican salamanders have the potential to regenerate their spinal cord and other organs to restore full functionality after injury. Mammals such as humans are not able to regenerate most organs. The restoration of the spinal cord in axolotl occurs in a three dimensional structure similar to an embryonic spinal cord. Due to their positions in the tissue, cells in the regenerated spinal cord know which function to perform in the restored tissue. In the current study the researchers applied the knowledge gained about the regenerative potential in axolotls to a mammal, the mouse. 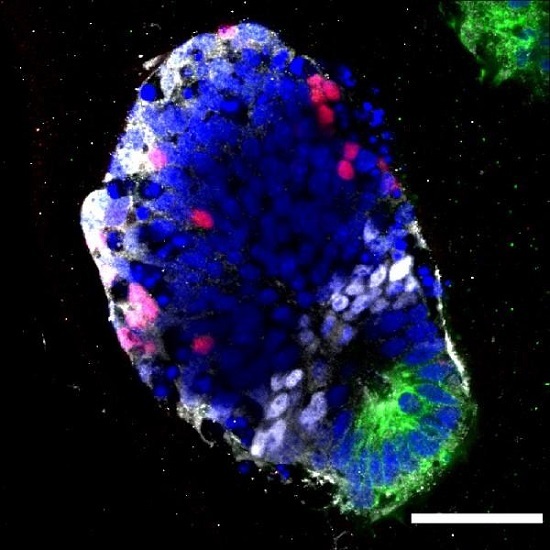 Single mouse embryonic stem cells embedded in a three-dimensional matrix and were grown in neural differentiation medium led to the clonal development of neuroepithelial cysts. These cysts settled in the midbrain and hindbrain along the neural axis. The goal, however, was to generate spinal cord in vitro. For this reason the team added retinoic acid to the culture medium on the second day of the 3D cell culture. The result not only caused the neural tissue to switch to spinal cord but also induced the formation of a local signaling center for forming all the different cell types of the spinal cord. For the first time the medical community could hereby reconstruct the structure of a typical embryonic neural tube in vitro. With this study the medical community have moved a tiny step closer to turn the idea of constructing a three-dimensional piece of spinal cord for transplantation in humans into reality.